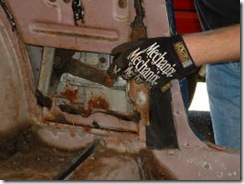 A classic Mustang quarter window regulator typically has two problems; either the window roller and clips have broken leaving your window regulator non-functional or it suffers from the same problem as the window regulator in that it can roll down on its own or can be pushed down leaving your Mustang vulnerable to un-authorized entry. This article and video will demonstrate just how easy it is to replace a worn out quarter window regulator on a 1967 Ford Mustang. 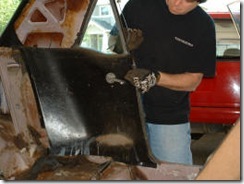 Your first step in removing the quarter window regulator is to get access to the area behind the interior rear quarter panel. 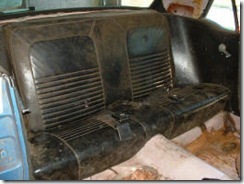 Remove the rear seat bottom. If your rear seat it secured you may need to give it a good nudge backward and up to release it from the seat brackets. Remove the seat back. Unbolt the seat back from the two securing hoops at the bottom of the seat back, then lift the seat back straight up toward the roof and lift it out of the mustang. With the Philips screw driver remove the screws that secure the quarter panel to the body. There are three screws; one at the window crank, one at the bottom front and one at the back of the panel about 1/4 of the way up the panel. 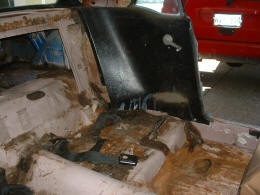 Remove the wind lace that covers the seam where the body and panel meat at the front. After the screws and wind lace are removed you can remove the panel by lifting it straight up, while you angle the bottom out a bit so the window handle shaft will clear the panel and them remove it from the car. 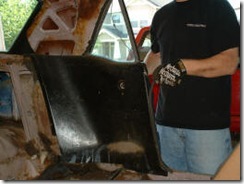 Use the window crank to lower the quarter window so you can see the quarter window arms through the bottom opening in the body. 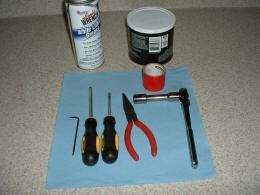 Remove the clips from the window rollers that hold the arms in the window tracks; then pop the window arms out of the rollers, the window is now free from the regulator. Lift the quarter window to the up position and secure it there with some duct tape and then roll the window regulator to an almost up position, this will make removal easier. With the 1/2 inch socket and ratchet remove the three bolts that are vertically in line (The center bolt holds a stop plate that you will need to reinstall) then remove the two remaining bolts, one above and one below the window crank shaft. 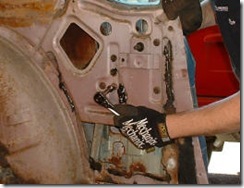 You can now remove the old window regulator. Before you install the new parts check to make sure that they match and set the new regulator arms in the same position as the old one. 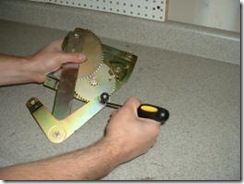 Setting the position the same way will ensure easy and familiar installation. 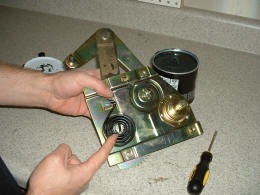 Remove the new roller and clips from the new regulator. The roller and clips will be placed into the window tracks and then the regulator will be secured to them when its installed in the Mustang. Apply grease to the window regulator spring, gears and to the arm where it pivots also apply to the the inside of the rollers and in the roller guide groove. Your ready to install the new window regulator! Watch the video for a full demonstration . Sorry, the videos are not set up to download but I will look into it to see what can be done to make them available. I will see what I can put together for you and get you a diagram. I use an Exploded View Illustration Manual at times during assembly, its a big help. There is also manuals for body assembly, chassis assembly, interior assembly. electrical assembly and engine component assembly. on replacement rear quarter window as in you regulator replacement will the window come out then? 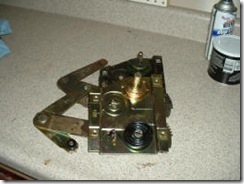 Simply removing the quarter window regulator will not make it possible to remove the window. To remove the window you will have take a few brackets off of the window frame and in some cases unbolt the track assembly. 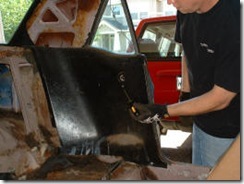 Great info on the rear window reg removal, I have a 66′ convertible I had a question as to how I remove the trim to get to the reg in the panel. It is a little different in the 66 convertible as there is an arm rest/ash tray in front of the interior panel. Any help would be greatly appreciated. 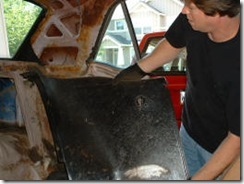 You should remove the back seat all the way (you probably did this already), look for all attaching screws that secure the panel to the metal frame and remove them; a top boot snap or two may also be screwed into the metal so check those too. The last thing I can think if is to remove the ash tray from the quarter panel, the full ash tray assembly should pull out; there may be a screw in the ash tray area that holds the panel in place. Also the windlace that finishes off the gap where the panel and the jamb meet should be removed. 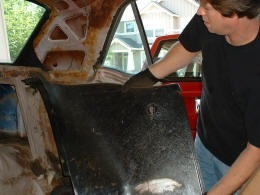 Hi, I am replacing the glass and quarter frame unit with another used unit with better chrome in a 67 mustang. But the window rocks back and forth about an inch and a half when it is in the track. Even after hooking everything back together. Am i missing something is there a way of adjusting it? 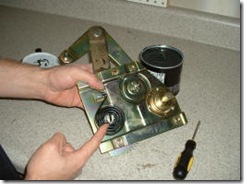 The quarter window should be fairly stable once installed and there is not a whole lot of adjustment needed. You may have a quarter window regulator that needs to be replace ed or the window roller and clips need to be replaced. 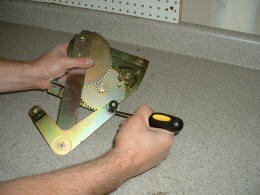 What you are looking for is the quarter window guide track that as you said, bolts to the body of the interior quarter. These parts are available used if you can find somebody that is parting out a Mustang. Thanks for the help, this is a great help! Please keep posting! hey buddy!! just would like to know were the rollers on the regulator roll on! like the small arm does it go vertical?? on the bottom of the window rail!! Your website is the best. So easy to follow and pictures and discription of parts anyone can understand. Thanks. First…I would like to thank you. Wish I had seen your video before I started. I am working on a 1966 conv. it fell down. I want to replace it but don’t know what direction it should go as far as pointing up or down. I have not yet removed the regulator. 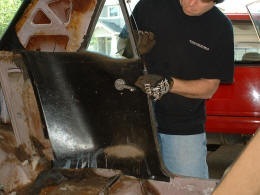 Unlike my ’66, your Mustang had a nice open access ..How will I be able to reach the window slot to attach the new rollers. When will I attach the stop plate. I need to remove the quarter windows and rails so I can clean out the “hard lube” so they will slide. I have everything unbolted from the car but cannot get the window or track assemble out. What am I missing? 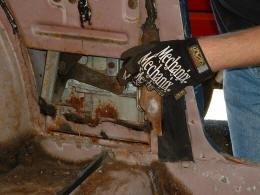 Check to see that you have removed the stop brackets that are mounted to the window frame; you may also have to remove the rubber strip and the quarter window to body seal. im working on my sons 66 coupe. does the 3 guides that are on the quarter window get replaced. I can rock the window back and fourth or is this normal. also are there any good web sites or books on how to adjust the windows so that they all line up and close properly im having quite the time trying to align them all. Thanks so much for your video instruction. 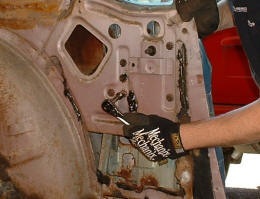 I’ve just now this moment been able to replace the rear window regulator on my 67 Mustang myself. Your instructions gave me the confidence I needed.